Originally, it was the scouts of the Clan Heidrun of Frederiksværk, who built the Imme Skinfaxe. The clan - among other goals - set about to test the theory that the trees used for the original ships were dug up instead of felled, as we do today. Therefore, the scouts set about digging up the roots of two large oak trees. The task required 5 -6 men’s work for a week... per tree! It needed four oaks to build the ship and all in all it required 12.000 working hours to build Imme Skinfaxe. The enormous task demanded in the ship building, however, bore fruit. Imme Skinfaxe turned out to be a very fast ship which can outsail most other Danish Viking ships, particularly in medium wind and when beating. 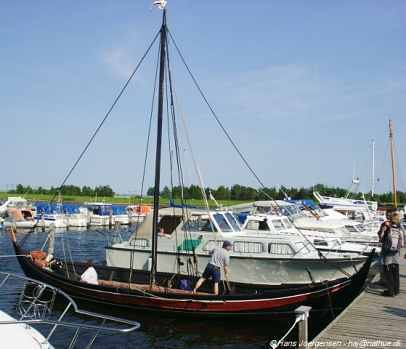 The ship was built as a 9/10th replica of the Skuldelev 3. The slightly reduced size was decided upon in order to fit into a certain category in the body of Maritime Law, but turned out to be a very sea-worthy combination. 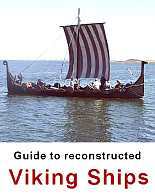 The concept of 9/10th replicas of the Skuldelev 3 has since been taken up by other boat guilds. Following the building, several of the master builders left Frederiksværk, and sailing became increasingly infrequent. Therefore, the ship was finally moved to Copenhagen and placed at first in the Tuborg Harbour, later the S/F South harbour of Copenhagen, its present base. Building: 1980 - 82. Launched on July 24th 1982. Boat Guild: Skinfaxe Boat Guild is in principle open to all interested - also people who do not have maritime experience.